Amn-o-Nisa coordinator Mossarat Qadeem (left) hugs Rosalia Miller from Nicaragua, mid-career MPA at the Harvard Kennedy School, who flew to Washington especially for the Tuesday event. My blogpost for Global Post, about a coalition of women affected by violence and war, on a mission to spread their message and highlight the unique roles of women in the struggle for peace. Also published in The News, Pakistan. WASHINGTON: It was when children began painting ambulances, hospitals and dead bodies in art class that Bushra Hyder decided it was time to actively work towards healing. That was 2009, and there were almost daily blasts in Peshawar, a Pakistani city not far from the border of Afghanistan, where Hyder runs an elementary and high school. The whole city, including the students and teachers at her school, was traumatised by the conflict raging around them. Those who could, fled to the capital Islamabad, or abroad, or anywhere but where they were on the frontlines. “The violence affected the people…socially and psychologically,” Hyder said, speaking at a seminar at the United States Institute for Peace (USIP) on Tuesday. 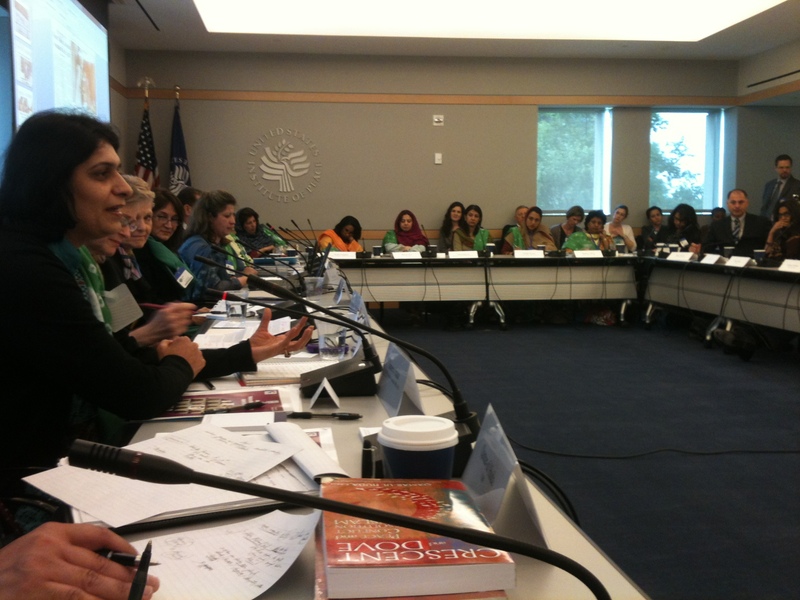 The USIP panel discussion, co-sponsored by The Institute for Inclusive Security, highlighted the work of Hyder and other women from Amn-o-Nisa (“Peace and Women”), also known as the Pakistan Women’s Coalition Against Extremism, which was formed in April 2011. The 20 women who came together in this voluntary coalition have been working for years on these issues, highlighting the unique role women play in the struggle to preserve human rights amidst a fight against extremism in Pakistan that too often leaves civilians caught in the middle. “Amn-o-Nisa is a platform for us to do collectively what we were doing on an individual basis,” Hyder told me when we met after the seminar. GlobalPost has earlier featured the work of the coalition’s coordinator, academic-turned-activist Mossarat Qadeem of Paimaan Alumni Trust, who rehabilitates and de-radicalizes young boys and women who have been pushed or driven into the Taliban fold. The U.S. Embassy in Islamabad supported the travel of 12 women from the coalition to visit the United States in order to meet policy-makers and activists and discuss issues of peace and security. Their Washington schedule included meetings with several law-makers as well as high-powered officials at the State Department. Amn-o-Nisa members from around Pakistan represent a wide range of professional sectors and lobby for policy reforms in three sectors critical to address extremism and counter radicalization: security, reconstruction and rehabilitation, and mediums of indoctrination (including formal and informal education). Through community outreach programs in Pakistan, they also engage with civil society, youth and women’s groups, the media, religious leaders, and the education sector. 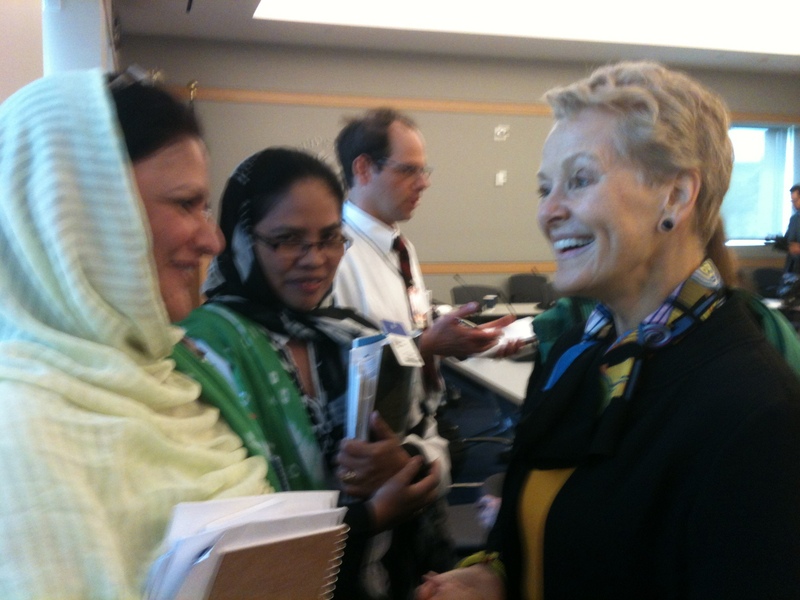 Dr. Kathleen Kuehnast, Director of USIP’s Center of Innovation on Gender and Conflict moderated the event, attended by several activists, journalists and US government officials. Amn-o-Nisa delegates with Ambassador Swanee Hunt in Washington D.C.
Hunt, a former Ambassador to Austria and an international expert on women’s rights, as well as a promoter of bringing women into the global peace and security agenda, is president of the Hunt Alternatives Fund, which includes the Institute for Inclusive Security and its Women Waging Peace Network. Wednesday evening, Hunt moderated an event titled “Women Moderating Extremism in Pakistan,” co-sponsored by the Meridian International Center and the Institute for Inclusive Security, in conjunction with the Community Engagement Office of the U.S. Mission in Islamabad, Pakistan. On Sunday, Amn-o-Nisa delegates will head to other cities, including New York, Chicago, San Diego, and Los Angeles, facilitated by the Meridian International Center. Their onward focus is on meeting grass-roots activists and creating people-to-people dialogue aimed at sharing best practices and strategies, and improving understanding – something that is badly needed in today’s polarized world.